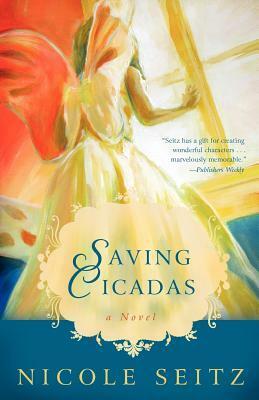 Saving Cicadas is a story of a family told through the eyes of a young girl. Her mother is facing hard times & must make a tough decision. A decision not totally understood by this 8 yr old girl. Trying to decide whether I wanted to read this book, I read some reader reviews and the first ones I read were pretty negative. They also contained ‘warnings’ to people not to read this book because of its Christian content and “anti-choice propaganda”. That definitely got my interest, so I had to read it. I was not disappointed. The characters are engaging and the book a charming read. There are family conflicts and surprises, but some of the biggest surprises come towards the end and I don’t want to give any of that away. Kudos to Nicole Seitz for taking on a difficult and controversial topic! Nicole Seitz and I share a hometown, and I have been fortunate to have attended one of her writing workshops. Though very different from my usual fare, I’ve now read three of her books and found them all rewarding. In some ways we share similar ideas and values but in others, we’re not even on the same planet. I find that her books make me reexamine my own viewpoint and at least recognize the validity of others. You’ll also get a great tale filled with memorable characters – and very familiar ones if you’ve ever lived in the South Carolina Low Country. I like books that take me away from my comfort zone and into religious and cultural worlds different from my own. Choosing only books that share your values and ideas is like surrounding yourself with sycophants and yes-men. They’re great for the ego but they’ll keep you from growing and cause you to perpetuate your mistakes. However, one thing that is never a mistake is investing your time in reading any of Nicole’s novels.